Add super high-speed 10Gb Ethernet over fibre to any computer with a PCIe slot or add to one of Sonnet's thunderbolt expansion chassis to any thunderbolt enabled computer. With increasing demands for greater data transfer speeds and more bandwidth over shared networks, and with specialized applications such as HD video editing using high-performance shared storage systems, it’s no wonder that 10 Gigabit Ethernet (10GbE) use has skyrocketed—this high-speed wired networking standard offers ten times the performance of Gigabit Ethernet, the common wired network connection included with most computers today. Sonnet offers a powerfully simple way to add dual-port 10GbE connectivity to your Mac Pro® tower or Windows® PC—the Presto™ 10GbE SFP+. 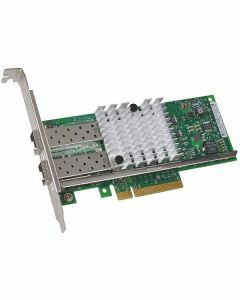 The Presto 10GbE SFP+ dual-port 10 Gigabit Ethernet PCI Express 2.0 adapter card enables you to connect your computer to high-speed infrastructure and storage without stepping down in speed. Setup is simple—after installing the low-profile card into an available x8 or x16 PCIe slot in your computer, just download and install a driver, connect to the switch or device’s 10GbE port via LC fiber optic cables (SFP+ transceivers and fiber cables sold separately), or copper cables (sold separately), and then configure the card through the OS X® Network control panel or Windows Device Manager. This Sonnet solution is perfect for high-performance computing where low latency, high bandwidth, and low CPU overhead are required.